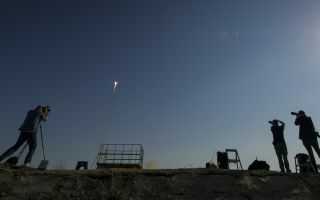 Members of the media photograph the Soyuz TMA-04M rocket launch from the Baikonur Cosmodrome in Kazakhstan on Tuesday, May 15, 2012. In this space wallpaper, members of the media photograph the Soyuz TMA-04M rocket launch from the Baikonur Cosmodrome in Kazakhstan on Tuesday, May 15, 2012. Heading to the International Space Station onboard the Soyuz are Expedition 31 Soyuz Commander Gennady Padalka, NASA Flight Engineer Joseph Acaba and Flight Engineer Sergei Revin.